There’s a lot of construction going on in our neighborhood. Four new houses are popping up and a couple of more lots are being cleared. This means noise (to include a barking Poodle), lots of construction debris, nails in the road and port-a-potties on the street. I was walking The Poodle just the other morning when a worker came out of one of the port-a-potties, leaving the door open in the process. It’s not like I’ve never seen the inside of one mind you. In fact, I’ve been in lots of them over the last twenty-eight plus years with all the marathons, distance races, and the like that I’ve participated in. But it got me to thinking about a toilet I saw recently while on my cross-country adventure with sis and company. This gal has to be mighty bored out-of-her tree if she’s writing about toilets. Perhaps the strain of recent months has made her not right in the head, you think. Have no fear. I’m OK. Things aren’t perfect by any means and yes, 2014 is going down on record as one of the WORST years ever. And besides, the whole world seems to be going nuts! So, I’m thinking a little levity is in order. While on our travels we had stopped at a restaurant. I think it was in New Mexico, but my mind is fuzzy on this particular detail. Understand that it was a whirly-whiz of two weeks and included such fun as searching for a gator in Louisiana, bowling for the first time in thirty years with Alexandre-the-Greatest, a romp in the White Sands of New Mexico, and Blizzard overload at a Dairy Queen in Arizona. Anyhow when I opened the women’s bathroom’s toilet stall I saw something that I cannot recall ever seeing. Not just the seat or lid…but the WHOLE commode. Admittedly, It took me quite aback. Hmm. I recall I stood peering tentatively into the toilet bowl with nose scrunched, feeling a lot more dubious than usual about the cleanliness of a restaurant toilet. OK. It’s just my opinion (and you know what that means!) but I cannot say I liked the look of it at all. In fact, I thought it thoroughly ugly. The toilet had a Darth Vader quality about it…as if The Dark One’s breathy, chilling, voice would rise up out of the commode as soon as I sat upon it. It didn’t help that the bathroom was quite dark as well, with dark Terra-cotta tiles, dim lighting, and dark cement floors. I know it’s silly but I wasn’t comfortable. My psyche was thrown off just a bit with the Darth Vader image that was now stuck in my head. I’d almost rather use one of those squat type toilets prevalent in Italy, Japan, and other places around the world. Yes, I’ve had my fair share of experience with that type of toilet, and while it’s true that it requires a certain skill and stamina (mastery of yoga’s Chair Pose comes to mind), it’s more sanitary and I wouldn’t have that heavy breathing sound in my head. Needless to say I didn’t hang around the Loo for long. Still, this inquiring mind took over. Was this black toilet an anomaly in the bathroom world? So, when the opportunity presented I naturally turned to Google. Well, who knew that black toilets are considered… um…glamorous?! 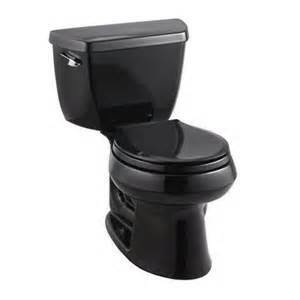 Lots of folks love the bold, unconventional, stylish look of black toilets and other bathroom fixtures. Clearly folks, I’m behind the times! Still, practical matters weigh in, so I hold fast to my original opinion of black toilets–worth not even two cents, I realize. Firstly, how can you tell if the toilet is really CLEAN? Not easy. In fact, lots of people commented that this is the number one downside of black toilet ownership. Ya think?! One commenter who raved about her black toilet weighed-in, posting that “having a black toilet is more forgiving if you forget cleaning.” Eew….disgusting! Secondly, and more importantly, it’s mighty hard to detect changes in your poop with a black toilet. OK…I know….ICK and EEW !. But, this is serious business. There are folks that need to monitor this aspect of their bodily function for medical reasons. And don’t get me started on the subject of black toilet paper! I need not say more. Black Toilet paper is popular too. So….It’s hotter than Hades outside but I think I’ll get my head out of the subject of toilets and take The Poodle out for a walk. Infinitely better for one’s head. ← It Can Happen to Any of Us…..